There are 4 types of subplots: one’s useless, one’s dangerous, one’s effective, and one is absolutely vital if you want the climax of your screenplay to work. Subplots matter far more than their name implies. If a screenplay dies in Act 2 or Act 3, it’s just as likely the problem lies in the subplots as in the main narrative. Let’s take a look at the 4 different types of subplot, and see how you can avoid the useless, be wary of the dangerous, embrace the effective, and ensure that your screenplay includes the one subplot it categorically needs. If you’re ever sitting in a cinema and you’re bored out of your skull, there’s a good chance you’re bang in the middle of a Type 1 subplot. The useless subplot, as its name none too subtly suggests, serves no narrative purpose. It doesn’t advance the central plot. It doesn’t develop the character. It doesn’t help explore some aspect of the theme. It’s generally there because the writer got to about page 35, looked at the vast empty spaces of Act 2 lying ahead of them, and thought, crikey, how the hell am I going to fill all those pages? I know! Subplot!!! Fargo is a great film but what’s the purpose of this subplot? Given their fecundity, it’s unlikely the Coens were looking to rack up a couple of easy pages here. But nor is it clear what bit of movie magic happens in the scene that made it impossible for them to leave this subplot out. It’s a mystery to me. This might seem self-evident, but the first tip I have regarding subplots is this: make sure they serve some narrative purpose. The second type of subplot is the thematic subplot. This is where you explore, possibly with minor characters, some other dimension of your premise – what it is you’re trying to say. One of my favourite romantic comedies, Moonstruck, has a couple of thematic subplots. The main narrative is about whether Loretta (Cher) will marry her pathetic fiancé Johnny Cammareri (Danny Aiello) or ditch him for his more passionate brother Ronny (Nic Cage) – who, to complicate matters, she sleeps with while delivering the wedding invite. But there are two other subplots. Her father, Cosmo (Vincent Gardenia) is having an affair with the aptly named Mona, and her mother, Rose (Olympia Dukakis) is getting hit on by a lecherous lecturer (John Mahoney). The subplot with Rose (Olympia Dukakis) and the jaded lecturer (John Mahoney) explores theme but doesn’t have any impact on the throughline of the film. While it’s true that Loretta and Ronny do run into Cosmo and Mona at the opera, I wouldn’t say that the main narrative is affected in any material way by either of these two subplots. They are just there to explore other dimensions of love, lust and relationships. Do they work in Moonstruck? Yes, they do. So why do I call thematic subplots “dangerous”? Because not all of us are as talented John Patrick Shanley. He won the Oscar for this screenplay Oscar and was nominated again for Doubt. This guy is seriously good so he, like Aaron Sorkin, can get away with stuff that mere mortals can’t. But, in the absence of prodigious skill, the type 2 thematic subplot can easily slip a classification and become an utterly useless Type 1 subplot. For the developing writer, I would urge caution in relation to thematic subplots and encourage you, at least initially, to focus on trying to include more of the next two types of subplot. Obviously we’d like to our subplots to be effective but how do we achieve that? The secret to successful subplots is to have them ultimately come back and have an impact on the main narrative. However insignificant it might seem upon introduction, a good subplot should eventually escalate the drama by making it harder for your protagonist to achieve their goal. A subplot is effective and justifies its place in the script if it ultimately causes a serious complication for the hero. Let’s take a look at An Officer and a Gentleman. The central narrative is about Zac Mayo (Richard Gere), a smartarse from the wrong side of the tracks, trying to graduate from the navy’s aviator school. That’s the throughline. But Zac has a little blackmarket business going in shiny shoes and belt buckles to help guys make sure they get their weekend “liberty” leave. This subplot is very important. Why? Because it ultimately comes back and affects that throughline. Drill Sergeant Foley (Lou Gossett Jr) – Zac’s mentor and antagonist – discovers this illicit sideline and wants him to quit from the program. “I want your D.O.R. (Discharge On Request)”. This triggers the supreme ordeal that is so important to the transformation of the protagonist (see my post on The Midpoint). It’s a simple subplot that’s introduced without fanfare but it ultimately creates a complication that threatens the hero’s pursuit of his goal and triggers evolution of the character. That’s an effective subplot, wouldn’t you say? It works because it complicates and escalates the drama. In Dead Poets Society, the throughline is about the boys embracing a more romantic view of life under the inspiration of their charismatic English teacher, Mr Keating (Robin Williams). But there is also a subplot about the relationship between Neil (Robert Sean Leonard) and his father that has a monumental impact on the throughline. Knowing his repressive father won’t allow him to play Puck in A Midsummer Night’s Dream, Neil forges his signature on a consent form. This happens early in Act 2 and Neil has a great old laugh as he mimics his father at the typewriter so we don’t think a whole lot of it. But a seed has been sown. When his father discovers the deception, he yanks Neil out of the school, and threatens him with military school, which triggers Neil’s suicide, which in turn provides the unlikely hero, Todd (Ethan Hawke) with the opportunity to literally take a stand at the climax. If this subplot weren’t there, Neil lives and Todd might forever continue to live life in the shadows. This climax not only affects the throughline, it facilitates its stunning conclusion. By any measure, I’d say that’s an effective subplot. In When Harry Met Sally, there is a subplot involving their best friends, Jess (Bruno Kirby) and Marie (Carrie Fisher). On the surface, this might look like it’s just a thematic subplot, the rapidity of their movement from meeting to marriage contrasting sharply with the slow burn of the relationship between the eponymous central characters. But it does more than that. The subplot involving best friends Jess (Bruno Kirby) and Marie (Carrie Fisher) provides the trigger for the Act 2 Turning Point in When Harry Met Sally. The wedding of Jess and Marie forces Harry and Sally, whose friendship has been severed after they finally slept together, to come together under the one roof again. This triggers a fractious exchange in the restaurant kitchen where Sally slugs Harry, triggering the Act 2 Turning Point. No Jess and Marie and the writer, Nora Ephron, would have to have contrived some other way for this crisis to be precipitated. Because of this subplot it happens absolutely organically. That makes it a really good subplot. However, there is a further class of subplot that matters even more than this. This is the one subplot you absolutely need if you want your screenplay to sing. To find out about this vital subplot, you’re going to have to read my next post – the one subplot you really need. And nice cliff hanger ending. Every time my husband and I watch FARGO (we own the DVD, & are huge Coen bros. fans), we have the same conversation about the purpose of the subplot you mention. My guess, however, is this: Marge is presented as an intelligent cop; however, she can be very trusting and slightly naive about the nature of people. She bought Mike’s story, and was shocked after learning Mike lied (and so convincingly). This, in turn, propels her to return to Jerry (because maybe he lied, too…and the evidence does point to that business). Without this scene, what would have prompted Marge to reinterview Jerry? Her instincts are confirmed when he “flees the interview.” (I’m a retired cop, and I love that scene). You could be right, Kathleen. I’ll check it out. Kathleen is spot on about Fargo’s subplot. As soon as I saw it mentioned in the article I figured someone would point out its purpose in the comments. Great article, by the way. I wouldn’t fault anyone on missing the point of the Mike Yanagita subplot (I know I didn’t get it for a long time), so I think the observation we need to take away from Fargo is, perhaps, clarity. Even though the subplot does have a specific, solid, necessary purpose, it ends up confusing a lot of viewers because it *appears* unnecessary. 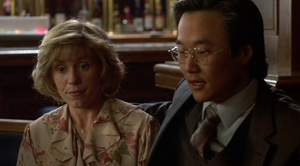 The last thing you want to do is lose the audience–luckily the scenes with Mike Yanagita are funny and well-written, a definite testament to the Coen’s skill–but most writers aren’t the Coen brothers. I don’t mean to advocate “dumbing it down,” but we should make sure any element of the story clear enough for the audience to figure it out on their own. Don’t give them 2 + 2 = 4, just give them 2 + 2 and let your audience participate in answering the questions themselves. If it’s not clear enough to figure out WITHOUT a pile of exposition, that element probably needs some work–but it’s worth it. Allowing the audience to put 2 and 2 together involves them in the story and respects their intelligence. Thanks, Joshua. One of the great mysteries has been resolved! I think you’re right. It’s a reminder that storytelling, for me at least, is so much about hearts than heads. In hindsight, we can rationalise that this subplot works but emotionally we dropped out of the story here. There is just no tension and it “feels” unrelate. Not their finest work. Similar subplot was present in “Sideways”, when Miles visits his mother on their way to Napa Valley. It doesn’t do much except some exposition that Miles has been divorced for 2 yrs and still hung up on his ex-wife. However, the exactly same subplot was there in “Taxi Driver”. Scorsese appears as a deranged passenger in Deniro’s cab. The purpose of the scene was to put violent ideas in Deniro’s mind. In the very next scene, he goes to buy a “piece”. Maybe writers could use more subtle methods than the obscure ones. The scene you talk about in Sideways, Sanket, does provide some exposition but it has a more significant role. Miles goes to his mother’s to steal money otherwise he can’t afford to go on this weekend. This tells us – in Act 1 – that he’s both struggling financially and of malleable integrity. I love that the writers were willing to push the character like this – a very knowledgeable wine lover who steals from his mother to support his habit. A lovely contradiction. Hi Allen, yes, scene does show him stealing money. But, the rest of the movie never shows him “explicitly” spending it. It was never even mentioned he was financially struggling. He did have a steady teacher job. Besides, they were already on the trip. If he had not been lucky and found the money, he wouldn’t have canceled the trip and gone back home. Anyway, that’s debatable. But, It does show his dubious character. I also realized, that it reveals first time that Jack is an actor and not a big one. Though I still think Payne and his partner could have done the entire sequence in a more subtle way, it remains one of my favorite films. Allen, You’re doing a great work on your blog. Thank you for that. I still think the Mike Yamagita scene is great. Joshua and Kathleen above are right about how the incident forces Frances McDormand’s character to rethink her ideas about trust and compassion. There is something very Minnesota about not just the buffet but the contradictions that the scene explores. In that region of America, people talk about the concept of “Minnesota Nice.” The term refers to how people in places like St. Paul are outwardly very nice and hospitable to strangers, while privately cautious, reserved, and keeping distance. To me the Mike subplot shows how Frances applies this classic Land of 1,000 Lakes strategy out in the world, when she is not at home in a trusted relationship with her husband, or at work following police procedure. It also seems somehow, but I am not sure how, related to the “more than life than money” theme in how it builds up such a sad universe for the characters to live in. Hope your blog comes back soon, I am a fan. Your blog is so amazing! I only came across it this morning but I’ve already read everything on it. I have a number of story ideas I’ve come up with over the years but never could put on paper as it’s difficult to know where to start. Your blog made me realise I already have many of the elements required for a possibly successful screenplay and has made writing one seem achievable. Thank you so much. The Fargo dinner reminds Frances of the importance of WIVES. Mike is very sad about his imaginary dead wife, while Jerry doesn’t show any concern about his kidnapped real wife. She suddenly realizes this. Just a punters view point – the Mike scenes are the ones I remember most from Fargo. In fact met a guy last week who eirily reminded me of mike! As for purpose… they added another layer of “things aren’t what they seem and its a weird old world”. Or maybe they were just “digestion time” – like an amuse bouche between meal courses. Not necessary, but it’s nice to have some mid-movie time to ruminate and enjoy, rather than feel you are on a plot treadmill trying to keep pace. One more thing about Marge. After she finds out that Mike was lying from her friend on the phone, they show her in her car thinking. To me it’s quite obvious that she’s realizing that if this nice guy could lie to her face, anyone else could too. Then she’s seen at the dealership, telling Jerry that she was on her way out of town, but stopped in just to ask one more quick thing. If it wasn’t for Mike lying to her, she would not have gone back to the dealership. I’m late to the party, but I’m enjoying this discussion of a scene that became a meme before memes were invented. I agree with all those above who see Marge and Mike as the trigger for her needing to revisit the dealership. She gets lulled by Mike’s sob story, and recognizes that underneath it, something is very wrong. It hits her that the same may well be true about Jerry. For that matter, comic relief is at least as old as Shakespeare. Petra, you’re way off. Frances’ character didn’t know that Jerry’s wife was missing, she was investigating the murders of the trooper and the passersby that night. Nobody but Jerry, his father and law and Stu, and the two bad buys, know about the kidnapping. So the scene was not about Margie realizing how important wives are, in light of Jerry’s lack of concern for his–she didn’t know anything about it. I know this is an old, old thread but I love the Mike Yanagita scene so much, I had to comment. I grew up in MN (in Minneapolis) and this scene has always brought me so much joy. People here can be so reserved and so many social interactions are awkward because no one says what they’re really thinking. While I totally agree with the assessment presented here, I always saw this scene as representing the weird under current of things that are unspoken. Things that are happening that aren’t immediately obvious because of the Scandinavian tendency to hide things. Either way, I’ll always love this scene. Great tips Allen.And nice cliffhanger ending. You’ve successfully hooked me in for the next episode.thanks for sharing.